Are you looking for a career in a new and expanding field? Polysomnographic technologists are health care practitioners who use “high-tech” equipment to diagnose and treat patients with sleep disorders. They work with a wide variety of patients, from infants to the elderly. They provide services in many settings including hospitals, clinics, and physician offices. The Polysomnographic Technology Program offers a full-time curriculum leading to a Bachelor of Science degree. Stony Brook University is accredited by Middle States Commission on Higher Education (http://www.msche.org). The Polysomnographic Technology Program is also an education program approved by the New York State Department of Education. 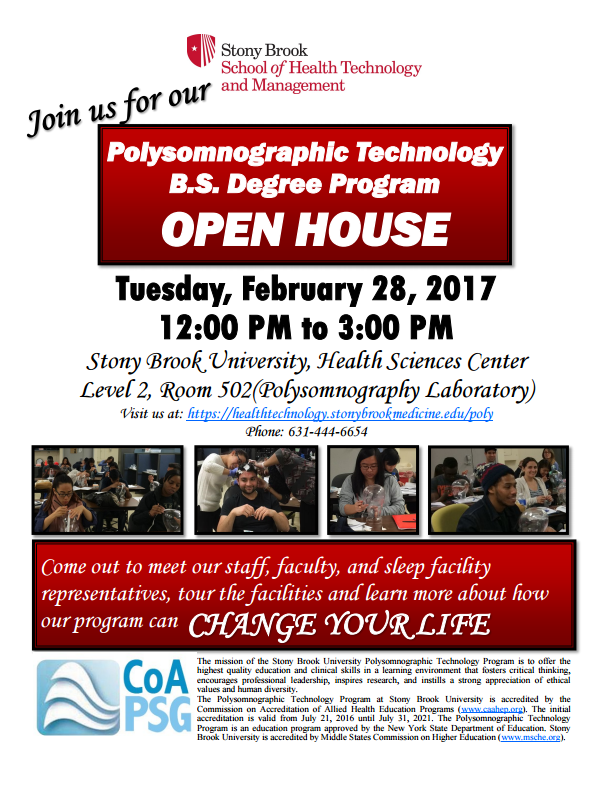 The Polysomnographic Technology Program at Stony Brook University is accredited by the Commission on Accreditation of Allied Health Education Programs (http://www.caahep.org). The initial accreditation is valid from July 21, 2016 until July 31, 2021.